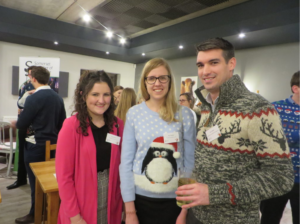 Investment Assistants Kishan Raja and Jason Hopton from Hawksmoor’s Taunton office attended the Somerset Chamber of Commerce Young Professionals Christmas event (complete with Christmas jumpers!). 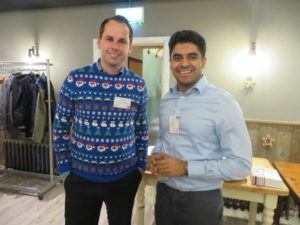 Kishan and Jason enjoyed the networking evening, and took part in the ‘speed-dating’ – an efficient way to get to know a number of new people in a short space of time. Other participants included young professionals from the accountancy and legal professions. Both Jason and Kishan featured in Somerset Voice (with Kishan making the front page! )- the Somerset Chamber of Commerce news magazine which is circulated to all Chamber members and the wider business community, and distributed to over 1600 businesses across Somerset.